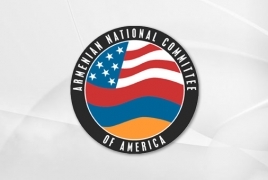 PanARMENIAN.Net - Armenia's new First Deputy Prime Minister Ararat Mirzoyan visited the ANCA on Thursday, July 19 for a constructive working meeting about new opportunities for the expansion of U.S.-Armenia relations and the full range of ANCA advocacy priorities. Mirzoyan was joined by Ambassador Grigor Hovhannissian, his Armenian government colleagues, and senior Embassy staff. The discussion covered a broad array of shared concerns, including regional challenges, threats, and opportunities, the security of Artsakh, justice for the Armenian Genocide, and the prospect for robust growth in the U.S.-Armenia political, economic, and military relationship. In terms of specific economic policy priorities, the ANCA is 1) exploring a $140 million MCC Science, Technology, Engineering, Art, and Math grant for Armenia's public schools, 2) advocating for a modern Tax Treaty to eliminate double taxation and promote financial transparency, 3) seeking a Social Security Agreement to protect benefits earned by people who divide their careers between the U.S. and Armenia, 4) researching the commercial viability of non-stop flights from Los Angeles to Yerevan, and 5) working to maximize the effectiveness of the existing Trade and Investment Framework Agreement Council and the U.S.-Armenia Economic Task Force. "At the level of bilateral relations, Armenia's peaceful, constitutional political transition to a forward-leaning new government has created exciting new opportunities for the growth of U.S.-Armenia ties. In terms of regional relations, policymakers in Washington increasingly understand and accept that the glaring democracy gap between Armenia and Azerbaijan needs to inform U.S. policy toward these two nations and, of course, the resolution of outstanding status and security issues between Artsakh and Azerbaijan. We had an excellent discussion with Deputy Prime Minister Mirzoyan regarding progress on both these fronts, and a broad array of shared priorities," said ANCA Executive Director Aram Hamparian. At a meeting with Chairman of the House Ways and Means Subcommittee on Tax Policy, U.S. Representative Peter Roskam, Mirzoyan revealed that snap parliamentary elections will be held in the country by April 2019.